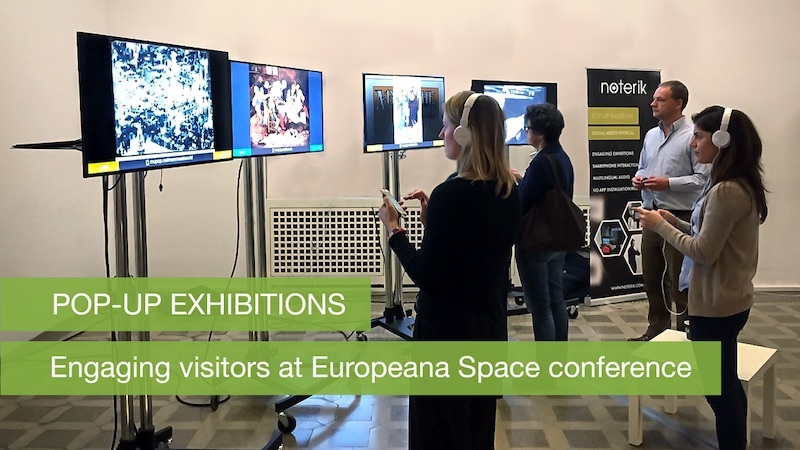 On the 21st and 22nd of November we exhibited our first real live MuPop exhibition at the final Europeana Space conference in Berlin. In the course of the conference, quite a number of attendees paid a visit to our installation in the main hall, using their smartphone to interact with the four exhibitions that were in place. The video exhibition curated and produced by Sound and Vision allowed visitors to listen to the audio of the video in their own language (we provided English, Dutch and Greek) and while watching the video they also regularly got multiple choice question pushed to their smartphone, which provided an educational dimension to the video exhibition. The combination of the appealing display of the big screen and the intuitive touchscreen movement and personalised audio on the phone clearly engaged visitors. Some of them hung around for over ten minutes at a single exhibition, trying to spot all the details in a picture, immersing themselves into the story behind the details. At the congress, on behalf of Noterik and the curating partners, Rutger Rozendal gave a presentation on the Pop-Up Museum. In his presentation slides you will find more details on the way cultural institutes can turn any kind of waiting room or other space equipped with a a big screen into a small pop-up exhibition space that can really engage visitors in the digital art they provide. You can watch a video registration of the MUPOP pitch in Berlin here. Please do not hesitate to contact us if you are interested to find out more about our MuPop solution.